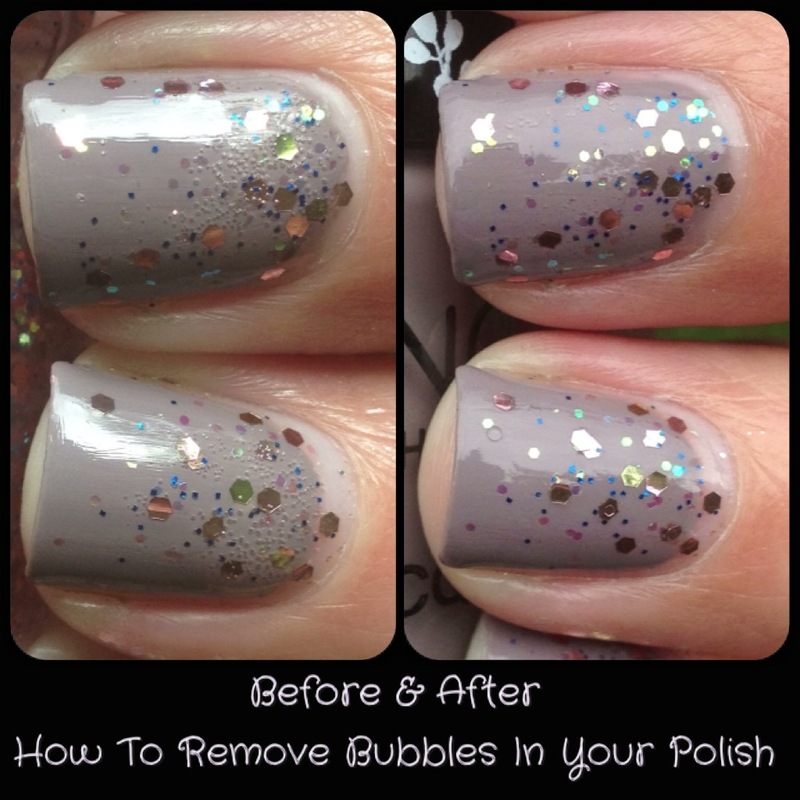 How To Save Bubbled Up Nails | Polish Me, Please! With ruined nails and work the next day, what was I supposed to do??? The bubbles were SO bad, I couldn’t just leave them. I didn’t have time to completely redo them and quite honestly it was late and I didn’t even want to take them off and just paint my nails a plain color. Plus, how much fun would that be? Scarcely any, that’s how much. So what I did was as follows: I dipped my clean up brush in my acetone, and VERY LIGHTLY painted over the bubbles with the acetone-saturated brush. I kept re-dipping and re-painting over the bubbles super lightly until the bubbles were melted away. It’s really important if you try this to have a super light touch, because you only want to melt the bubbles, you don’t want to eat through the colored polish itself. Once I was satisfied that all the bubbles were gone, or once I felt like I’d gotten as many out as I can without ruining the polish beneath the bubbles, I let the polish dry completely again, and then added a thick coat of Jessica Brilliance. This might not work for everyone, but it worked well for me. If you don’t use multiple coats of polish, or if your topcoat is really thin maybe it wont work as well, but if the alternative is bubbly polish, I’d still give it a try! 🙂 Ready to see how my nails turned out? Thanks, I don’t get bubbling except w glitters w this thick base. Whether I sponge them or dab them too much w the brush I tend to overwork it and get bubbles like crazy!! Bubbles are the worst!!! i have that problem when the top coat gets thick.. even though i add some thinner, the bubbles come back.. just like a fenix from the ashes.. i hate bubbles.. i’ll try this next time.. yay. Ugh I hate bubbles too. They’re probably my most hated disasticure maker. They just pop up and ruin all your hard work at the last possible second! sometimes i fake some blindness just to avoid an OCD situation. Omg this is amazing, I wish I had more than one like to give! I’ll definitely try this out the next time I mess up my nails because I’m impatient. On a side note though, the bubbles in your mani actually look kind of cute along with the glitters. I’ve thought about trying this before, but once I am done with a mani, I usually just don’t feel like dealing with it anymore and spending even more time fixing it! I totally understand that!!! It’s the worst thing ever when you spend all this time on your nails and then something swoops in at the last second and ruins them!! It’s like FORGET IT, I’M DONE!!! Great post, I hate bubbles. Thank you for offering your advice. Props to Lesley for picking some awesome polish colors. I’ve seen these before, and I think I’m going to pick some up next time. Today when I went to my nail places for the failed Essie hunt, I was talking to my nail guy (before I started crying) and I was asking him about top coats. I told him how many issues I was having with Seche Vite lately despite using it for the last 2 years without any issues. He said he would let the Seche people know just for feedback since I’m not the only one who mentioned that to him lately. Well, maybe they made some changes or something…who knows!? Anyway, this is a great combo! My question is: Holy CRAP how did you get so many bubbles??? That would be nice if they fixed the formula because dang it- I love my seche vite and when I start using it again I want it to work!! Oh and I got so many bubbles because that pretty, pretty glitter is in that awful thick snot-consistency clear base (like the fergie star glitter polish!) that keeps the glitter wonderfully suspended but gives me such trouble when I try to use it. Soooooo I kept dabbing and dabbing the glitter on w a sponge and it just kept sticking and kinda pulling up so when I put on my top coat- bubble bubble! Oh yes that’s right! That makes sense then. And you’re totally right. The glitter is so pretty I just love it. 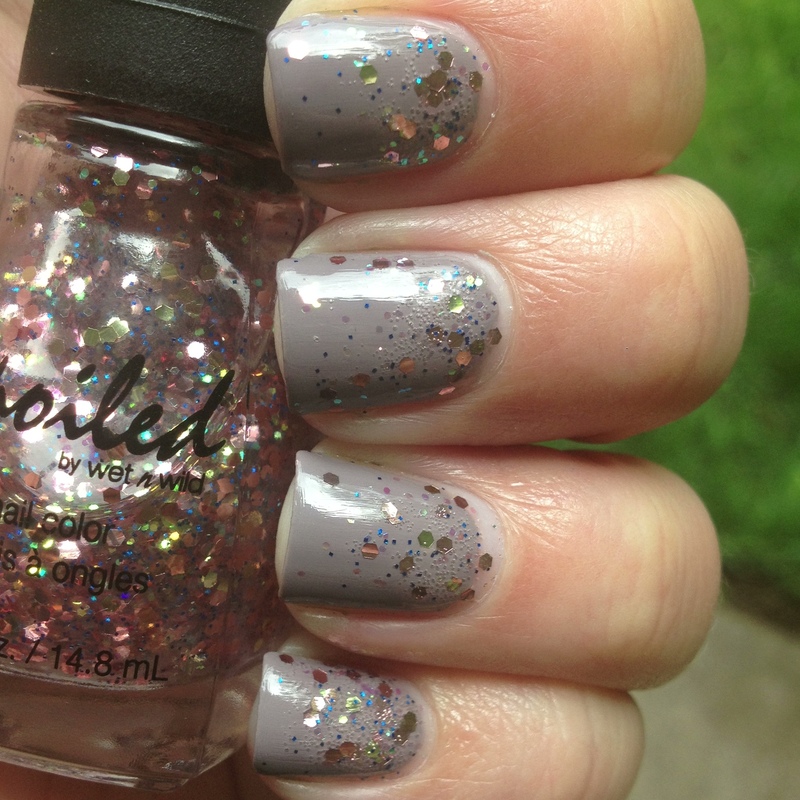 The soft rosey pink and those teeny holographic bits… lovely. I’ll just thin it some and/or not try to do the whole gradient thing again. OMG, enabling the enabler! I feel so freaking proud right now! My last bottle of Seche hasn’t been great, either. I keep freaking thinning it and I’ve gotten more bubbles and wrinkling than usual, too. I may try out some of the other quick-driers like Out the Door or Poshe the next time I need a bottle, which will be soon. Cynthia- don’t you use poshe and didn’t you say it was really good? I have got to try something else as my Jessica is getting low and I don’t really want to pay to have it shipped here. I can’t get Jessica anywhere on the regular. Only sporadically at Marshall’s which I never go to. omg this is soooo awesome! Thanks for sharing this! You’re welcome! I was just so happy that I could do something and not have to completely redo my nails! I’ve only ever had really bad bubbles when using feathers, and when using OPI RapiDry top coat that had gotten old and thick. I haven’t used either in a while and no bubble problems! That’s good! They’re so dang annoying!! Ughhhh. So helpful! Thank you so much. I am definitely going to try this next time I get attacked by bubbles. You’re welcome! I hope it works for you if you ever try it. Thanks for reading and commenting! Pingback: Black and White and Neon All Over | Polish Me, Please! You use non-acetone remover?? It still takes off your glitter polish and everything? Do you use it because it works for you, so you just don’t change which kind you buy or do you have sensitive skin or something? I would like to stay away from acetone, but I just don’t think I can. Lol you sound like an addict i just dont think i can. Lol i have always used non acetone yes. I use the sally hansen one with the vitamins and all i use it because changing my polish so much with the acetone my cuticles and nails and fingers rven were getting so dry it was gross. It takes a little more pushing but yes it gets the glitter off. The trick is to just make sure that the cotton wab or whatever you use is rrally moist again when you go on to the glitter nails. But it definetly gets the job done. Acetone is soooo drying but you’re right, I’m afraid I am an addict and probably can’t switch over. What I definitely can’t so tho is use pure acetone like some people, I’ve never tried the glycerin trick, but acetone by itself is just too drying for everything except clean up. Clean up I gotta use the evil acetone just cuz it works so well.